I thought about this post a lot and am a day late, but wanted to write it anyway. I didn’t date a lot growing up or even as a young adult. I usually had one relationship and then stuck to it until I didn’t any longer. I’m happy for the time we had together. It was worthwhile and I appreciate what you brought to my life and I don’t regret it. I wasn’t ready for you. I wasn’t an entire person when I was with you and even still struggle to be a good partner. I’m sure that means that I didn’t treat you as well as you deserved. I didn’t understand it until I was much older, but I had commitment issues even at a young age. That affected my ability to care about you. Life has turned out exactly how it was meant to and I’m happy for the life I have and hope that you are happy too. Life is too short to live in regret. I don’t look back and wish I had done things differently, because this path has led me to my two wonderful boys and my husband of nearly thirteen years. Could I have made better decisions along the way? Absolutely! Did I love with all of my heart when I should have? No! Have I learned how to be a better person along the way? I hope so. I don’t lack closure in my life from lost love anymore. There have been opportunities lost and things that should or should not have been said. But, when I look into the big dark eyes of my beautiful boys, I know that the love I have now, is the love I was always meant to. Before I begin, I have to say that I have such mad respect for my fellow writers, JC Wing and AK Lawrence who tackled a very difficult topic yesterday about a family member they dislike. To lay it all out, with so much raw emotion is what beautiful writing is all about. I wimped out and that’s all I’ll say about that, but some serious mad props to both of them for their beauty, strength, and honesty. (Both posts are linked to their names). Today’s post is about things I miss. I don’t miss much in my life. I’m a live-in-the-now kind of girl. I try and enjoy the path that I’m currently on so that it doesn’t pass me by. My grandmother’s hands. They were soft and pretty. When I was little I used to play with her rings, twirling them around her fingers, enjoying her closeness. I used to straighten them up so that they all lined up perfectly, and then would have to re-do it when they turned again. I wear her original wedding band, now. And every morning when I put it on I think of her, her soft hands, her good heart, and how much I miss having her in my life. The unbridled happiness of my children when they were toddlers. They found joy in everything and had tears for nothing. They had no need to be sad, lonely, or worried. As they grow, I know that fear and unhappiness becomes a part of life, but I miss the days when they had no concerns, upsets, or worries. Silence and solitude. My youngest is a lot like me in this way. He likes to be alone for hours on end and always has. I believe that I could go days in silence if I could, without speaking or sound. I miss the quietness that comes with solitude, which may come as a great surprise to many. I do tend to be an extrovert and I also love social interaction. But I also need to recharge and be alone with my thoughts, which doesn’t happen nearly as often as I would like, but I also understand that being needed is a good thing, and I’m not complaining. For all of the things I miss, I’ve found many other things that fulfill me. But I don’t think I’ll ever stop missing my Grandma’s hands. There’s nothing too exciting here, I’m afraid. I’ll lay it out for you as quickly and painlessly as possible. Wake up at 5:30 am because I’ve convinced myself that I’m working out today. 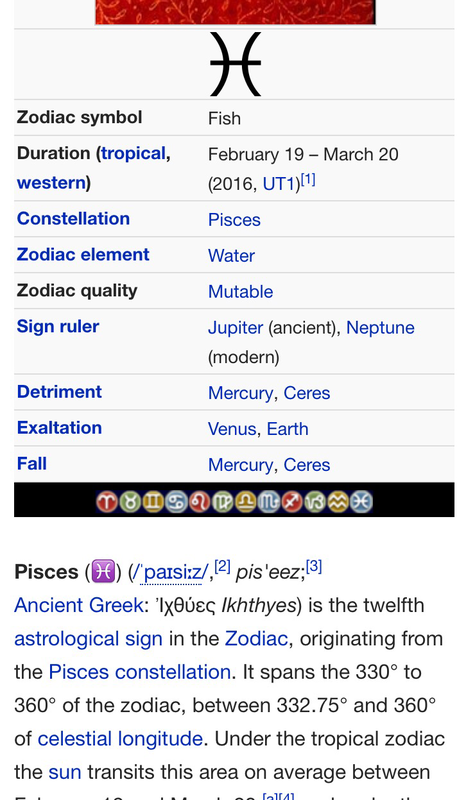 At least, I think I’m a Pisces, which is what I’ve gone with my entire life. But since I was abandoned I have no idea what the actual day of my birth is. Since Pisces are born between February 19th and March 20th, it’s possible that I may have been born before or after. The sign of the fish does seem to describe me in many ways, so maybe the person who chose my birthday did get it right! My head was reeling at all of the information out there about Pisces. 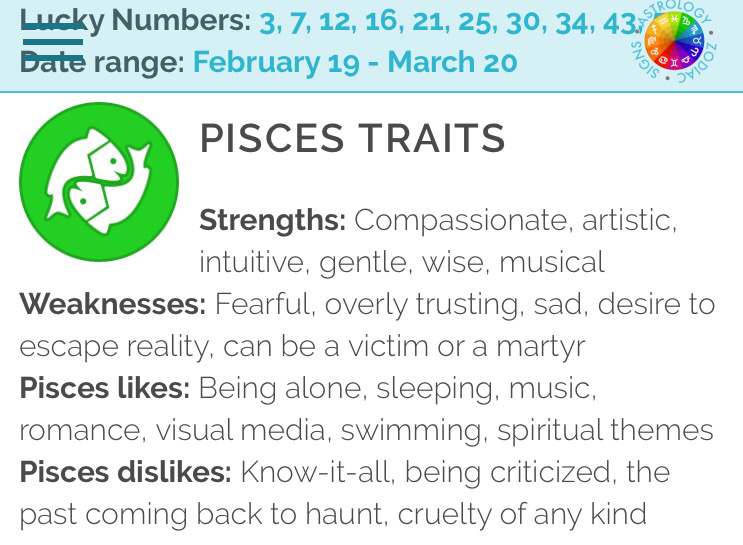 Silly me, I thought being a Pisces was simply about being a sensitive and compassionate person, but it’s much more complicated than that. Astrology is all about how planets line up and to what degree, mythology, stars etc. but for this post’s purposes, we’ll stick with the basics. It is Monday morning after all. Mostly, the sign fits, though it doesn’t often cross my mind that I’m who I am because I’m a Pisces. I’m probably more Pisces than anything else so I guess I’ll keep it. All three are a good representation of my taste in music at random times. Just as easily Eminem, Justin Timberlake, Maroon Five, Ed Sheeran, Gavin Degraw, or my latest obsession, James Bay or Fort Minor could’ve easily popped up. I do love Taylor Swift and have for a while. I have an affinity for the singer/songwriter, male or female, it doesn’t matter. I love the beautiful stories they tell through music, especially the ones who play the guitar. I’ll often do playlists for my books and have one for each that I’ve written on Spotify. I love how music speaks to our soul and pushes us to limits we never knew we were capable of. And I love how it connects us to one another, creating moments that are remembered with a few simple notes. Those three songs don’t have a story behind them, for me. They’re just fun and I enjoy all of them for different reasons. What’s on your playlist?!? There’s something you should know about me. I LOOOOOOVE quotes. I don’t often post or cite them, but I find something soothing and lyrical about those simple bits of wisdom from others. I keep them hidden in my heart for comfort and warmth and pull them out when I need them the most. I especially love quotes from Ralph Waldo Emerson, Robert Frost, Helen Keller, Dr. Seuss, Maya Angelou, and the list goes on. I used to keep a book of my favorite quotes when I was younger in my search for inspiration and wisdom, and even nor a quote will stay with me reminding me to be strong, or grateful, or kind. Words have always been one of my passions and I love reading those of others whether they be poetic, wise, or insightful. The quote I love the most, that I carry with me every day is one by Maya Angelou. I think about it when I want to be angry, ugly, or nasty, and it think about it when I don’t. I don’t always make the right choices but I try. I also often think of Ms. Angelou’s words when I think about giving up on writing. I remind myself of what it felt like when I stopped any how frustrated I felt with life. This reminds me that every decision in my life takes me down a different road and that every decision makes all the difference. I hope that I get to make a difference, which is why I’m drawn to both the Maya Angelou and Robert Frost quotes. I wonder why else we would be here unless it’s to matter to someone and to have some type of significance. Even if my contribution is small, these words remind me not to be selfish and that my decisions affect others. Even if I only inspire my children, that will truly have made all of the difference for me.